Trini Youth off to Miami's Orange Bowl! 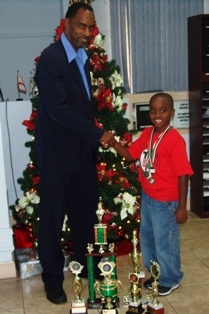 Lesley-Ann Nelson, "Kid's Chess goes to the International Chess Championship in Miami, Florida," 19 December 2006 (Port-of-Spain, Trinidad). The Miami Winter Chess Championship will be taking place in Miami from December 26th-29th, 2006 followed by the Junior Orange Bowl Scholastic Chess Championship from January 3rd- 5th ,2007. The Kid's Chess team of these Tournaments is drawn from the Tunapuna and Arima Boys' Roman Catholic Schools, and the Fyzabald Composite School. This six-member Team aged 6-16 years will be playing in the 9 and under, 12 and under, and 16 and under categories. Just one month ago, the Tunapuna Boys' R.C School Team appeared in the FCB Primary School Chess Championship, where they placed third. In early December, the six-member team participated in the Central Viking School Tournament, an Annual Chess Tournament. From Left- Mr. Andre Leveau-Communication Manager, Akeenie Murray, Keno Samuel, Lesley-Ann Nelson-Manager of Kid's Chess, Ronnie Nelson at front and Kevin Mahabir. Team Members - Akeenie Murray, Keno Samuel, Kevin Mahabir, Stephan Pierre, Ronnie Nelson Jnr. and Daniel Nelson intend to demonstrate the precision, strategy and critical thinking that derives from the game of chess. All players hold several medals and trophies from previous Tournaments and Ronnie Nelson Jnr. 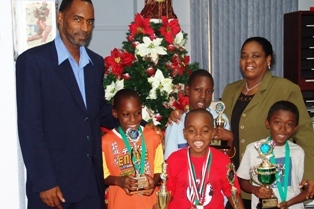 is the current under 10 National Chess Championship for Trinidad and Tobago. Sports Enthusiasts and Lovers of Chess in particular are encouraged to support these chessists - Junior players - in their quest for wider exposure at the international level. Contact the President of Kid's Chess - Ms. Lesley-Ann Nelson at (868) 775-2358 to make your contribution to building discipline and character in Tomorrow's Young men. Season's Greetings. Yes, its been some time now. Well I have been busy with so much, and now with the team going to a chess tourney to Miami. As always the sponsorship is not always forthcoming, but its Christmas - a time for giving. I have chosen some pictures to go with the article which I hope you can publish , the pictures were taken during their visit at the Ministry Of Sports. I have also included the link to YOUTUBE with a new video release - "We Reach" by Iwer George, one of our best Calypsonians. But , I wish to give thanks to some of our ongoing sponsors and persons who have taken the time to care. They are Simone Laquis and friends, Mr and Mrs Attong of Super Travel, sports personnel Ruskin Mark and producer Coreen at NCC, Jaye-Q Baptiste of CNC3, the Jaye-Q Show, Nelcia Robinson, and most importantly my family and you Daaim Shabazz for your support over the past two years. So keep the beat going. If there is any one I forgot, I say thanks. Mr Andre LeVeau and R.J Nelson with a collection of his trophies.